We are in the final week of the regular season. Four teams are locks for an NCAA Regional. Baylor is hot and should be in. TCU is on the bubble, and likely out. Goodbye, West Virginia. The Mountaineers and Kansas must win the Big 12 Tournament to secure an NCAA Regional berth. Kansas State has sent Brad Hill out with an amazing weekend by beating in-state rival Kansas two out of three times. Some fan bases will likely cry foul this week (What is going on in Lubbock?). Oklahoma State is the first team this season to hold on to the top spot. It wasn’t pretty though. While the Big 12 Tournament is set, there is still a lot to play for. TCU and Baylor want to strengthen their bubbles. 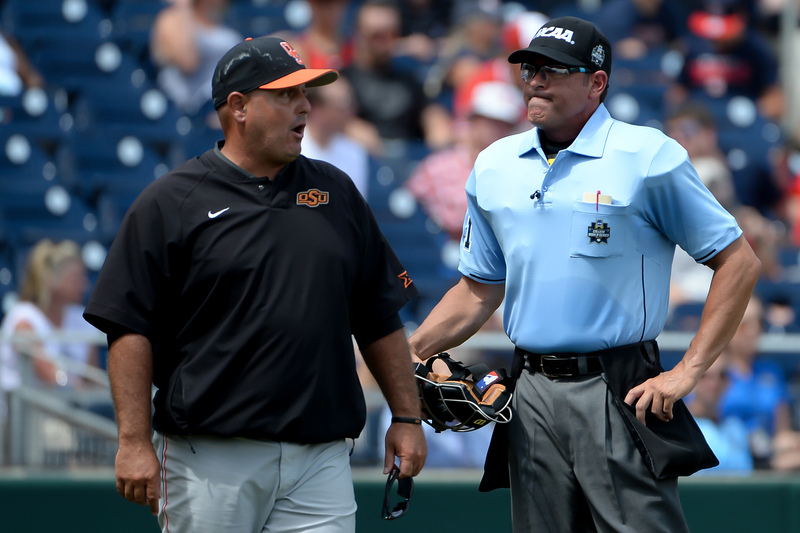 Texas Tech, Oklahoma State and Texas are hoping to host regionals. Oklahoma just wants to regain momentum. West Virginia would like to send its seniors out on a good note. Kansas wants to keep coach Ritch Price around. Alas, the latest Heartland College Sports Power Rankings are below as we close out the regular season. For a second, I thought about placing Baylor as the top team. After all, the Bears have taken series from both Oklahoma State and Texas Tech. Then again, they’ve also dropped a series to Kansas and have been swept twice. Oklahoma State has consistently proven itself as the top dog in Big 12 Conference play. With a 17-4 conference record, this is one of the most impressive showings ever recorded. Unfortunately, their terrible play in non-conference action will likely place them as a No.2 seed in the NCAA Regionals. Then again, if they continue their impressive action and win the Big 12 Tournament Championship, the selection committee may reward them with a hosting bid. There is plenty to play for this upcoming weekend. After taking a week off, the Longhorns now host TCU. For Texas, it’s about a hosting bid. David Pierce’s team is No.21 in the RPI rankings as of Tuesday. They have a 9-11 road record currently. Some of those road wins are mighty spicy though. They took a series at Oklahoma and another series at Texas Tech. This team also features a series victory over Oklahoma State, a sweep over Baylor, and non-conference wins vs. Stanford and at LSU. That’s a quality resume. 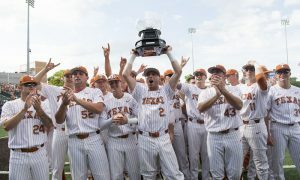 If Texas wins the Big 12 Tournament Championship, Austin probably hosts a regional. How they fare against TCU will determine how much work they will need to do in Oklahoma City. Winners of 14 of their last 15 games, Baylor is en fuego. 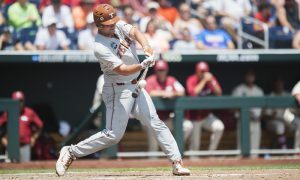 They recently became the first team since Texas in March to take a series from Oklahoma State. The schedule has set them up favorably, but Baylor is taking complete advantage. Steve Rodriguez’s team has thrust itself into the regional projections. Right now, most see them as a three seed. That’s likely because they are No.50 in the RPI rankings. First comes a road trip to West Virginia. That is a golden opportunity to improve the 9-8 road record Baylor has. Of course, the Big 12 Tournament is after that. If Cody Bradford remains as dominant as he has been, Baylor is guaranteed at least two victories. I like Baylor’s chances to improve to a No.2 seed. Let’s not forget. This is a “rebuilding” year for Baylor. Is Steve Rodriguez the coach of the year? TCU is slowly climbing an inclinated hill. It’s still doubtful they make a regional. This team has to play in Austin this weekend, and then they have to perform well at the Big 12 Championship. They dropped their Friday game to West Virginia, but fought back to win the series. That was basically an elimination series for a potential at-large berth. Unfortunately for TCU, it is also a home series. Right now, TCU is considered the fourth team out of a regional berth on the d1baseball.com projections. Can the Horned Frogs pull off the resurrection from the grave? Remember, I buried this team a couple of weeks ago when Luken Baker and Jared Janczak were announced finished for the season. Winners of eight of their last nine, TCU is looking to prove me wrong. I’m certain two fanbases are going to be upset with this ranking. First off, Texas Tech went 0-1 and did not look good against Dallas Baptist in Lubbock. This team should have been motivated after a screwjob took place in Dallas to give the Patriots a controversial 6-5 victory. We’re not certain how much the umpires were paid in that game, but payment was not necessary for Dallas Baptist to take a road game in Lubbock. Tech is no longer seen as a top 10 team. They are 3-7 in their last 10 games. They’ve provided life to an otherwise dead TCU squad. They dropped two home games to Texas. The Red Raiders are an ugly baseball team right now. This weekend will probably be a strong barometer on whether Tech goes to Omaha or not. They’ve had over a week off to recuperate and self-reflect. A recharging of the batteries might be exactly what Tech needed. It’s not always about being the best team. Many times, it’s who the hottest team is. This is the other team that likely will be complaining about where they are ranked. They have every right to do so. Oklahoma is No.6 this week because of what TCU and Baylor did this past weekend. Oklahoma won a quality road series against UCF and helped out the Big 12 Conference. The Sooners have been marvelous in non-conference play. While being the complete opposite of Oklahoma State, the Sooners have not shown to be a great team within conference play. Right now, TCU and Baylor are hot. 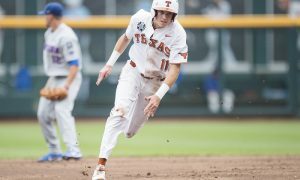 Texas and Texas Tech hold series victories over the Sooners. Oklahoma State swept the Bedlam Series. Oklahoma is a good team. They beat the teams they are supposed to beat. They’re not a great team, and this is a great conference. That’s why they are No.6. Look at the bright side though. They are going to be in the NCAA Regionals. Not every team above them are certain they will be selected. The only hope for West Virginia to score a berth into the NCAA Regionals now is to win the Big 12 Championship. Ultimately, their road struggles early in the season proved to be too much for them to overcome. At this point, it’s only right for the rest of the Big 12 Conference to choose a side and root for the Baylor Bears. Baylor is projected to be in a regional and they are hot. Theoretically, Baylor is that team that could make a surprise run. They’re hot. Randy Mazey is still a fantastic coach. While this year’s team did not live up to expectations, it is a great moment to learn and move forward. West Virginia baseball is in great hands. Things are looking up for a program with virtually no history. Dave Serrano is an amazing coach and should have that pitching staff ready to go next season. What a glorious weekend for Kansas State baseball. It’s been an awful season for this club. It was a nice gesture by the team to win the final conference series Brad Hill will coach them in. There is no better way to send him out then to beat your in-state rival. Coach Hill is the greatest coach in program history. Unfortunately, the past five years haven’t been up to club expectations. It was just a marvelous moment for Hill to receive a Gatorade bath on his way out the door. We tip our caps to Brad Hill, and wish him well in the future. Ritch Price is officially on the hottest seat in the Big 12 Conference. The clock is ticking. Losing a series to Kansas State is just the icing on the cake for a miserable season by this Jayhawks team. They were supposed to at least be on the bubble for an NCAA berth. Now, Price might not even survive the season. We think he will. Firing Price at season’s end will only set this program back where the football team is currently at. However, he will not be back if the Jayhawks miss out on a regional berth in 2019. This young team will be considered one of the older teams. If you can’t win with a lineup that’s been together for three seasons, there is no excuse. Kansas is officially out of rebuilding mode. 2019: NCAA Regional or bust.